I'm not really sure why this cartoon got a video game. It's not a bad show. I remember watching reruns of it and it was fine, but still. It was a show from the early 60s; I don't know why THQ decided to put out a NES game about it in 1992. There just isn't much people won't slap on a viddy game to make some quick money back. You've probably heard of how bad this game is. The AVGN did a (partial) episode of it, and all I would really need to do is just embed a speedrun of it and call it a day, but even if you're not here for the article, I owe you more than that. 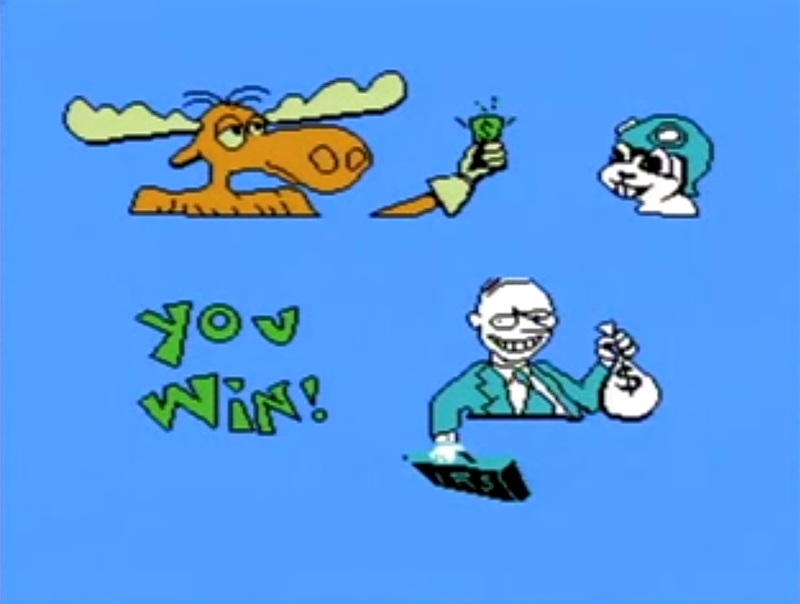 The Adventures of Rocky and Bullwinkle and Friends game was released for the NES, Game Boy, SNES, and Genesis from 1992 to 1994 by THQ. The game can be beaten in roughly ten minutes. The music is an eight second loop. "MS Paint" is a good description of the graphics. Nobody wanted this game, and nobody wanted to make it, either. I don't want to cover it anymore, but I'm stuck with it now and that's a lesson to learn. It's not unplayable, just like how stubbing your toe isn't lethal. You just don't want to do it. The goal of the game is to travel to Abominable Mansion and collect Bullwinkle's inheritance from... someone. You get one screen of setup for the game. You also get an NES standard one screen ending, which I'll put at the end of this article. There's no proper final boss—the game just ends. You've bought the game, you've gotten your ten minutes of playtime, there's nothing we have left for you. You just win, go home and play something else. I feel bad for anyone who bought it, and worse for anyone who worked on it.